Are you interested in attending the 2019 Down Under Bowl? Register your interest here and once we have more information we will forward it directly to you! Former NFL player and 3 Time Superbowl Champion, Ed McCaffrey, is in Sydney this week promoting the 2017 College Football Sydney Cup between the Stanford University Cardinals and the Rice University Owls which will kick off at 12 noon on Sunday, 27 August 2017 at Allianz Stadium. While in Sydney, Ed McCaffrey will be donating some of his time to attend the Gridiron Australia National Coaching Conference which will be held at Sydney Olympic Park this coming weekend (19-21 May 2017). 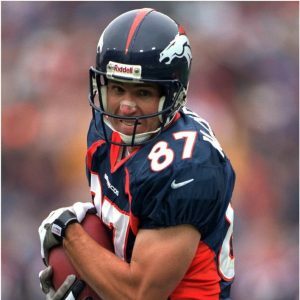 Ed McCaffrey was a wide receiver in the NFL for thirteen seasons and played for the New York Giants (1991–1993), San Francisco 49ers (1994) and the Denver Broncos (1995–2003). During his thirteen-year career, he made a Pro Bowl appearance in 1998 and won three Super Bowl rings – Super Bowl XXIX as a 49er and the Super Bowls XXXII and XXXIII as a Bronco. The 2017 Down Under Bowl will be held from the 26 June – 3 July 2017 on the Gold Coast. The tournament started in 1989 and was originally established to promote the sport of American Football, Gridiron, to the people of Australia and New Zealand. Prior standouts of the Down Under Bowl include Jake “The Snake” Plummer – former quarterback for the Denver Broncos, Ahman Green – running back for the Green Bay Packers, Rob Morris – 2007 Super Bowl Champ with the Indianapolis Colts, Australian Jesse Williams – drafted by the Seattle Seahawks and more recently Australian player Adam Gotsis who was the 2nd round pick for the Denver Broncos in the 2016 NFL Draft. This year event features a Football Clinic lead by USA College Football Coaches. Bring it on Sports are hiring Coaches and Officials for the Raiders Youth Gridiron Academy. All Coaches and Officials will be paid. Coaches will be expected to manage groups of players aged 7-14yrs. be available from 4.30pm to 6.30pm on Tuesdays Nights commencing the 11th October 2016 in addition to 1.5 hours on Friday Nights commencing the 14th October 2016. Coaching is held at David Phillips Sports Complex in Daceyville. 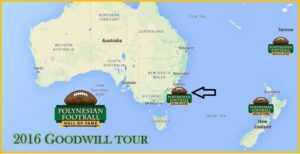 Polynesian Football Hall of Fame to visit Australia! 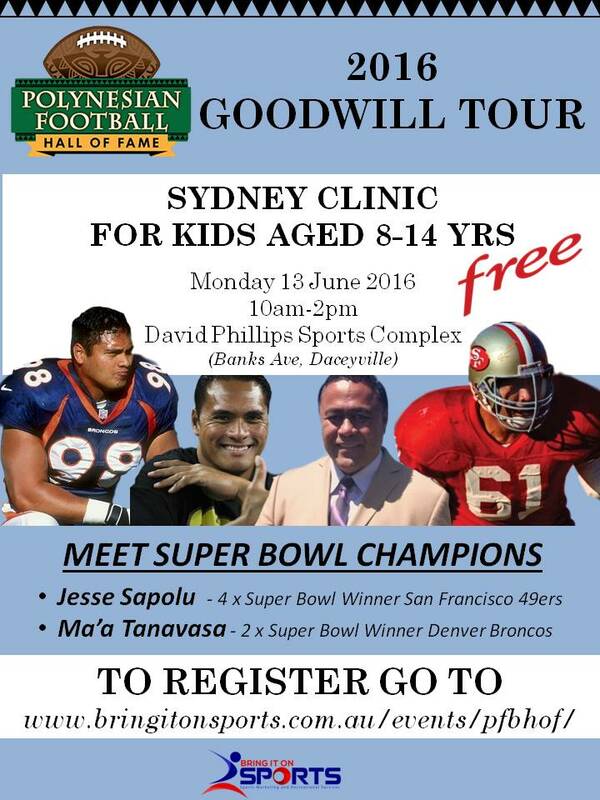 Polynesian Football Hall of Fame Goodwill Tour to visit Australia, New Zealand and Samoa. 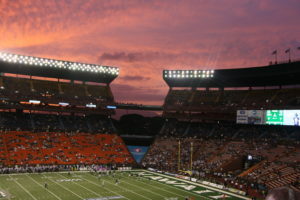 s a 501(C)(3) organization, the Hall of Fame preserves and promotes Polynesian football history and awards scholarships for Polynesian student-athletes. About Jesse Sapolu – As a former offensive lineman for the University of Hawai’i, Jesse played offensive guard and center for the San Francisco 49ers for 15 seasons (1983-97). He was named an All-Pro twice and is one of only 23 NFL players in history to win four or more Super Bowl Rings. Jesse is Chairman and Co-Founder of the Polynesian Football Hall of Fame and a Class of 2015 Inductee. About Ma’a Tanuvasa – As a former defensive end for the University of Hawaii, Ma’a was an eighth round draft pick by the Los Angeles Rams. He is a Two-Time Super Bowl Champion as a member of the Denver Broncos and led his team in sacks (1993, 1994). Ma’a was inducted into the Hawaii Sports Hall of Fame in 2006. He serves as Vice-Chairman and the Co-Founder of the Polynesian Football Hall of Fame. Current UH Offensive Line Coach, Chris Naeole, will be visiting Australia looking to recruit new talent for the UH Warriors Football Team. This will be Coach Naeole’s 2nd trip to Australia. On his visit down under last year, he discovered Max Hendrie, a rugby union player with Scots College. This year he is hoping to continue his recruiting success by finding some more “diamonds in the rough”. Naeole was drafted tenth overall in the 1997 N FL Draft by the New Orleans Saints. He was highest selected guard since Eric Moore in 1988, and the first Colorado offensive lineman selected in the first round since Stan Brock in 1980. He served as Hawaii’s interim head coach for its final four games of the 2015 season and has coached the offensive line for the past three seasons. Excitement is building in Australia as the NFL Draft starts tomorrow and this year there quite a few Australian’s in the mix, most notably, Adam Gotsis from Georgia Tech who was a 3 year starter as a Defensive Lineman and who has been noticed by NFL scouts. This, coupled with the success of Jarryd Hayne, and the fact that the University of Hawaii will be in Australia to play their season opener against University of Cal in Sydney on Saturday 27 August 2016 brings American Football to a new place in Australia and we feel there will be more and more Australian’s keen on trying to make it to the NFL. Bring it on Sports Director, Paul Manera, says that most people that play in the NFL have all played college football and it is seen as the first stepping stone to making it to the NFL. Coach Naeole will be visiting Sydney from 5-7 May 2016. For more information please contact Bring it on Sports via email at info@bringitonsports.com.au or call Paul Manera on 0406 538 634. The Down Under Bowl was inaugurated in 1989 and gives Australian and New Zealand football players the opportunity to train with and compete against USA High School Football Teams. 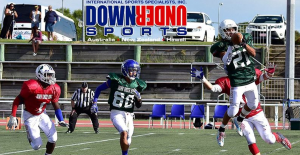 We are currently looking for a coach to supervise Australian and New Zealand gridiron players that are participating in this year’s Down Under Bowl on the Gold Coast. Assistant Gridiron coach with one of the USA Down Under Bowl Teams. Supervise the Australian and New Zealand players and be a point of contact for them at the event on the Gold Coast. Ensure that the players are following the rules and acting with great character and are ambassadors for the sport. The successful applicant will be required to arrive in the Gold Coast on Monday the 27 June 2016 and depart the Gold Coast on Monday the 4 July 2016. * Dates, itinerary and inclusions are subject to change and are dependent on ISSI and the Down Under Bowl organisers. Please note: this is not a paid position however the above inclusion will be provided.